Happy Friday! 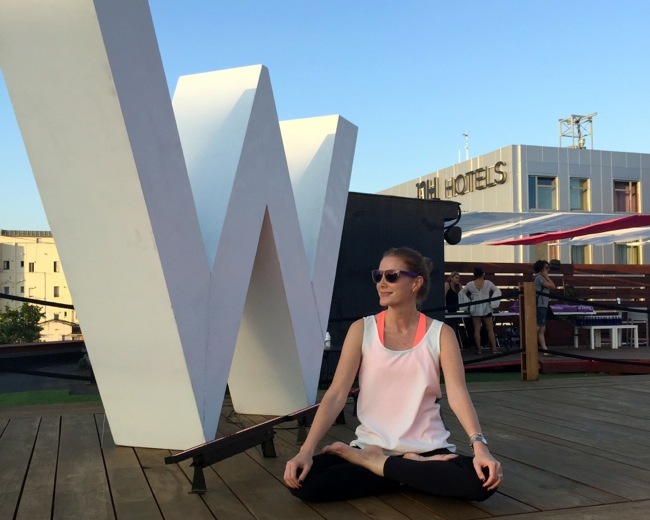 !In summer we tend to take care more attention of our body and that is why a few weeks ago I did not hesitated to attend a super sunset yoga class organized by W Hotel in a super cool industrial sort of terrace with magnificent views of the city and with the rebel yogi teacher Tara Stiles. For the ones that do not know her yet, she is the owner of Strala, a yoga method that encourages to the freedom of movement and she also has an studio in SOHO. I must say that I’m not such a yogi lover but I had pretty clear that I did not wanted to miss the opportunity to have a class with such a myth. You have no clue how much energy and good vibrations Tara gives you in her classes, she is a boost of energy and her smile and laugh are so contagious that is really fun to be in her classes! An amazing evening in which I could understand why every wants to attend to their classes where ever she goes. Actually with the launching of her first fitness program called Fit with Tara Stiles, she has been traveling around amazing places like W Bali, W Maldives, W Verbier y W Hong Kong. And the best of all is that pretty soon she will open here first Strala center in Europe… and where? Well… Barcelona!!! Yogi lovers… Stay tuned because we will be able to enjoy Tar’s yoga pretty soon but in the meantime, I leave you with some pictures of that great evening!! Conocían a Tara Stiles y su yoga Strala? Les gusta practicar yoga? Qué les pareció esta idea de una clase de yoga con vistas y al atardecer? Did you knew Tara Stiles and her Strala yoga? Do you practice yoga? What do you think about this idea of having yoga with amazing views during sunset? Yo fui a la sesión del amanecer y fue una experiencia muy bonita. Tara es muy agradable. Practico un poco de yoga por mi cuenta pero tendría que encontrar un hueco para dedicarle más tiempo. Qué belleza! Las vistas son preciosas, qué puede ser más relajante? I love yoga and those views are amazing! Yo tampoco soy muy yoguista pero como experiencia tuvo que ser inolvidable! Ya te digo Cris!! La verdad que me gustó y mucho!